Sunset Drive Xbox One product is a digital code, once bought, the code will be sent to your email or can be downloaded directly from your screen. These codes are original and produced by the developer.These codes have no expiry date. 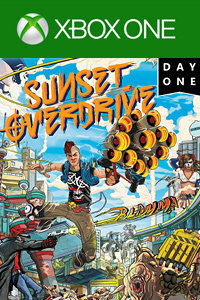 Sunset Overdrive Day One Edition is a totally amazing third-person shooter video game published by Microsoft for Xbox One. This fantastic game is set on fictional city in the year 2027 is available here in in Livecards.eu you can buy the digital code of this action / adventure Xbox One game that is also released in multiple consoles in 2014. For more Xbox Digital Game Codes for Xbox Ones, we also highly recommend Spotlight Dance Central or Kinect Sports Rivals. Be sure to check out other popular Xbox One games such as Quantum Break or Tom Clancy's The Division. Buying Sunset Overdrive + Day One DLC for Xbox One from Livecards.eu is as easy as 1 2 3! Simply fill in your email address, select a payment method and complete the payment! We have some of the cheapest Sunset Overdrive + Day One DLC for Xbox One on the market.